Welcome to the Husky Family! We recognize you play an important role in your student’s college experience. Use this website to access student support services, to discover campus events and to find contact information for campus offices. When we work together, students receive consistent messages, learn to navigate the University system and develop the skills to be global citizens of the 21st century. 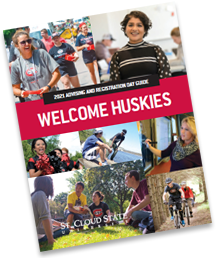 Send us an email if you have any questions or concerns: families@stcloudstate.edu. There are many scholarships available for your students! Check out Huskies Scholarships for more information.